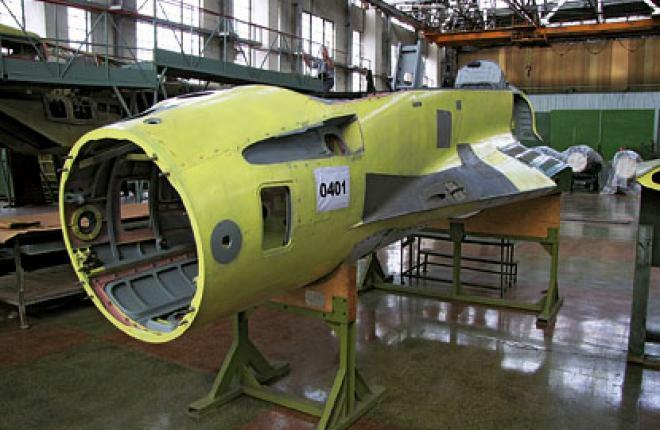 RSK MiG has started manufacturing work on an additional batch of MiG-29K naval fighters for the Indian Navy. The first set of aircraft components was loaded into the final assembly rigs at MiG’s Lukhovitzy plant on 2 August, with the intention of delivering to the customer in 2012. An initial batch of 12 MiG-29Ks and four two-seat MiG-29KUBs was ordered in 2004 as part of a $1.5-billion deal that included the Kiev-class aircraft carrier Admiral Gorshkov. RSK MiG has now delivered 11 aircraft and is planning to ship the remaining five by the end of the year. According to MiG’s General Director Sergei Korotkov India’s MiG-29K fleet has accumulated over 1,000 flying hours since the type’s introduction into service in February 2010. In 2010 India took up an option for 29 additional MiG-29Ks in a deal estimated to be worth $1.2-$1.5 billion. This brings the Indian Navy’s total number of the new naval fighters to 45. The MiG-29K features an upgraded airframe with increased use of composites. A digital fly-by-wire control system is fitted as is an in-flight refueling system, a glass cockpit and a Phazotron Zhuk-ME slotted-array radar. The aircraft can carry an increased weapons load including export versions of the R-73 (AA-11 ‘Archer’) and the R-77/RVV-AE (AA-12 ‘Adder’) air-to-air missiles along with Kh-35 (AS-20 ‘Kayak’) and Kh-31A (AS-17 ‘Krypton’) anti-ship missiles.